–IMAGINE being invited to your favorite artist's studio and getting a chance to thumb through his or her sketchbook. That's how I felt when I previewed James Gurney's new sketchbook app Boyhood Home. I'm super busy right now–I'm preparing for a major landscape show–and I initially thought I would quickly thumb through the images, perhaps delve into a few I found intriguing and get back to work. However, after experiencing a couple pages of Boyhood Home, I was hooked and retired to my overstuffed chair to linger over each page. Surprisingly, the digital sketchbook experience actually was as intriguing as thumbing through a favorite artist's sketchbook. It's a different experience, of course, but has unique advantages. The book is divided into three modes: the sketches, which you can zoom into, a video with voice over, and often an additional video feature, like a digital sidebar. The videos are about one to two minutes long and for my taste about right, allowing Gurney to share tips while not slowing down the experience. As you can see in the screen grab above you tap the icons in the upper right depending on which feature you want. Tap the image and the interface fades away. The "i" button gives you information regarding the medium and subject matter–which in one case informed me about a sketching devise known as a white gel pen–which I immediately noted for addition to my plein air kit. The sketchbook is 25 pages long and includes a page showing Gurney's tools and media (primarily gouache and casein). Be sure to use the pinch and zoom feature on all the images as it allows you to see incredibly close detail. The zoom feature alone makes this well worth the $5 price, but the fusion of video, voice over, and images makes this as close to actually being in a cafe with Gurney, discussing how he created each sketch. 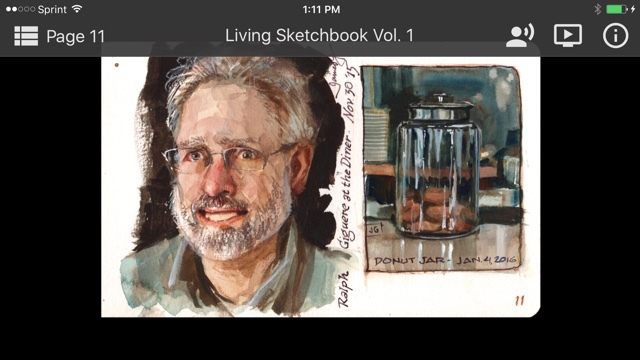 The first volume of the Living Sketchbook app will be available March 20 for $4.99 for both iOS and Android phones and tablets (go here for updates). For the tips and inspiration alone I eagerly look forward to more sketchbooks.